The night was filled with anticipation as 4,000+ people walked to the Filene Center at Wolf Trap. The electricity was strong. You could feel it in the air. It was reminiscent of feelings I had at past concerts. As we took our seats and the lights dimmed to a beautiful purple glow, the focus was on the beautiful gold love symbol hanging as the one of the main focal points of the backdrop. The orchestra was ready to take us on the ride of our lives. The opening song “For You” set the tone for what was about to happen and reinforce the reason we were all there. The orchestrations mixed in with his vocals were superb. I knew this was going to be a spiritual experience. As the orchestra went from song to song videos, movie clips and audio from past interviews were skillfully woven in. Each video and audio clip was purposeful and part of the vignette. 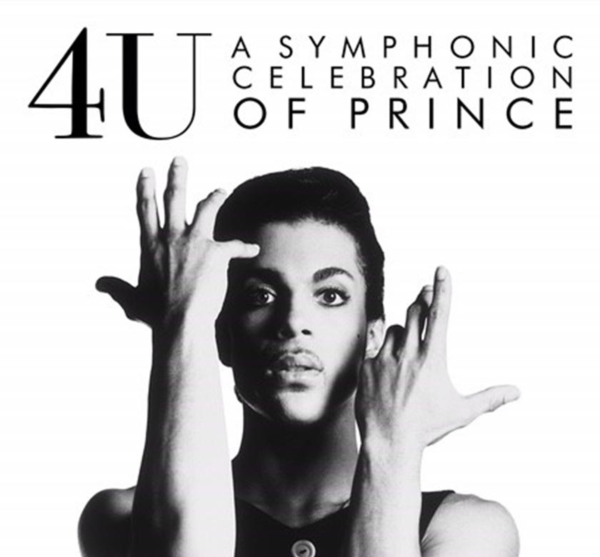 The creative and artistic approach Prince took with each tour was replicated at this concert. It was as if he was guiding the team of arrangers and producers to build a symphonic experience worthy of his name. The first chair violinist was the conduit from the orchestra to the audience, bridging any perceived or unperceived gaps. Her skillful and soulful performance permeated the theater. Following a well-placed intermission, we were back in the musical magic of the hits and b-sides which led us to the finale of Purple Rain complete with audio and video footage from the Syracuse 1985 Purple Rain Tour Concert. It was hard to hold back the tears and not get swept up in the rushing euphoria that comes during the ~ Ooo, Ooo, Ooo, Ooo. Even though it was an expected song to end the evening it was no less the song that will always bind us together even if it’s just that for that moment – love 4 one another.